My battery exploded. Is this likely a result of a malfunction? The travel trailer had been stationary for several weeks. Plugged in for for five days to 110 V.
Most likely you had a dead cell in your battery. The converter is like a power bank but it doesn't force power into the battery. A converter is different than a battery charger, the battery charger forces power to the battery. 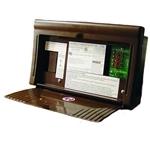 The rv battery is the primary source of power and it will pull as needed from the converter. This being said, it was more than likely an issue with poor battery maintenance or an old or cheap battery.